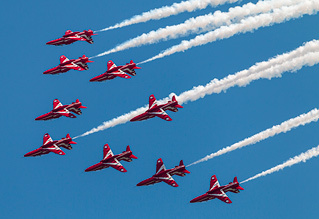 In the weeks and months leading up to this airshow season, so much has been made of the new CAA display regulations that have now been imposed on the organisers and venues of air displays up and down the country. Most feared-for was the golden child of British airshow venues, Old Warden; with its close, intimate displays now looking highly under threat, Shuttleworth had more to lose than most. 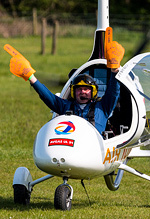 Sam Wise reports from a sun-drenched and sold out Old Warden for UKAR. Photography from as credited. 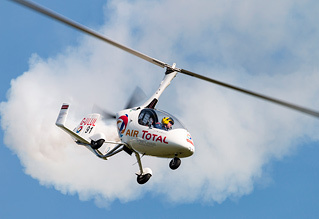 So, have the new regulations spelt an end-of-days for the Shuttleworth Collection's shows? The short answer is no. Not even the CAA can take away the inherent charm of Old Warden, the passion and love for the aircraft that rolls over you even before you've left your car, the relaxed pleasantries of the crowd and the timelessness of the whole place. 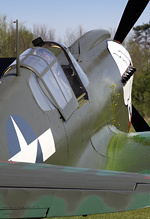 As you walk up and down the fence, watch the aircraft fly in and see the volunteers and pilots servicing their beloved machines you feel very much at ease, and that was no different on Sunday. The vehicle parade, as much a part of the Collection shows as the flying, still went ahead; the re-enactors continued educating visitors near the hangars; everywhere you looked you could see the history of the place, and once the aircraft were up in the air, the sounds of aeroplanes from a bygone era still filled the Old Warden skies. The longer answer is: a great deal of inconsistency in display distances and heights left many confused as to how exactly the new rules were being applied, and - for Shuttleworth to retain the magic its flying displays had before - this inconsistency definitely needs to be addressed. 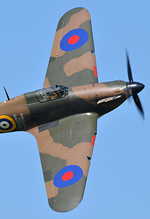 For the airshow-goer and especially the enthusiast, the flying display is the main event of the show and what was on offer on Sunday was a shade of that which made Shuttleworth the greatest air display venue in the UK, bar none. Before we talk about that in detail, there were a few other moments of note at this show. Billed as the headline act and probably the public's most anticipated display were, of course, the Red Arrows, making their first appearance at Old Warden in over three decades. Following Red Ten's customary arrival in an RAF Squirrel HT1, the team arrived overhead at precisely 1502 in formation to proceed into their first public display of the 2016 season. Sadly, despite the wall-to-wall blue skies, they were limited to only performing their rolling show as Luton ATC couldn't clear them up to the height required for their full display. Squadron Leader Mike Ling retains his role for 2016, and does his job as well as ever - however it wasn't the smoothest start to the team's season, as they had to cope with an airspace intrusion that cut short the Reds' display. Mike had to remind all pilots to check their NOTAMs as a stray Gazelle helicopter flew into the display's restricted airspace - and the pilot of said helicopter probably got quite a shock when the team "buzzed" it with their smoke on (at a safe distance, as it was being managed by the same Luton ATC). For all the (rightful) controversy in the preceding days regarding road closures at the team's request, and of course all the new regulations in the name of "crowd safety", it seems that the biggest danger posed on the day came from the air. A debut for the show came in the form of the Global Stars display team - a quartet of pilots formed of four British aerobatic champions that have displayed together as far away as India and Bahrain. This appearance marked the first time that the team had displayed at Shuttleworth and only the second time they've displayed in the UK. They performed with a synchronised "dotty" smoke system which interrupted the smoke flow to create broken streams via wi-fi - it was certainly different but it didn't add quite that much over a regular smoke display. The team performed very well over the site with some exciting manoeuvres, but at times could've done with being much closer - certainly the solo display portion felt distant at times. Having said that, in the days following the show, Mark Jefferies - one of the four pilots and a multiple British aerobatic champion - stated publicly on social media that he found the new display distances "hard to fly", and if a pilot of that supreme calibre and skill finds the new regulations harder to manage, it seems clear that the CAA have been ill-advised in their application. Distance really was the issue of the day though, and inconsistency was the key word in that regard. There is no doubt that we saw the effects of the CAA's new regulations on Sunday, and there seemed to be a great deal of confusion - on both sides of the crowdline - as to how they should be implemented. Certainly, for the most part, the Collection's own aircraft were displayed at a great distance and height, which for most of them was entirely inappropriate for the speed and nature; the Po-2 was easily the worst affected by this, and it begs the question as to why a slow, lumbering, gentle aircraft such as the 'Mule' had to be so far away - any value of seeing the aircraft in the air was completely lost. The Hangar 11 P-40 was equally distant and high and made little impact as a display item - however, only an hour later, Stu Goldspink flew Hurricane I R4118 much closer to the crowd round the dog-leg following some aerobatics (performed at an appropriate distance). Peter Teichman has been a very outspoken critic of the new regulations and on the Hangar 11 Facebook page he has stated that even a single infringement now could cost him his Display Authority, forcing him to be overly-cautious. For one of the most popular and anticipated display pilots - usually a highlight on any programme - to have their routines heavily neutered by these new rules is worrying. Similar to the Po-2 was the Anson - hardly an agile aircraft, it has nevertheless been safely flown round the bend at close distances perfectly safely in the past, only to be relegated to extraordinary heights and distances at this event. 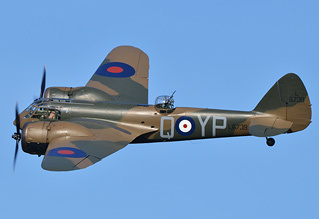 But it was then immediately followed by the Blenheim, which John Romain flew very similarly to its display at this venue last July! Two similarly-sized, twin-engined vintage aircraft with seemingly entirely different rules applied to each! The most concerning aspect of these over zealous changes is that it has, ironically, made things far more dangerous for the pilots of the aircraft themselves. During the morning's pilot chat, Frank Chapman - pilot of the Westland Lysander in the display - commented that he was now forced to fly the 'Lizzie' at more than twice the distance previously permitted and that as a result he felt less safe due to not being over the relative comfort of the runway for the majority of the time. Given the nature of the aircraft in the Collection, it is clear that the risk they present to the public is utterly minimal but the risk presented to the pilots could be quite high - by forcing them to fly over trees (and indeed, houses! ), the new regulations have greatly increased the dangers in the event of an aircraft emergency. This is unacceptable and, given the Collection's safety record and the decades of flying deemed safe enough before, unjustifiably inflexible. 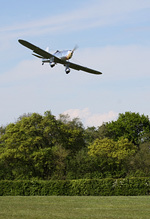 The argument could even be made that it runs counter to their perceived aims: the CAA has been explicit in its requirements for preventing so-called secondary crowds, but this was never a problem at Old Warden, where the flying was close enough to the crowd that that was the best place to view it from. By pushing the aircraft further away, and with aircraft of the size of the Collection's, viewing outside actually becomes more appealing now for some, as it would potentially give the better view of the flying. Surely this is exactly what the CAA would want to prevent? It is clear that Old Warden, the Shuttleworth Collection, its pilots and any pilots wishing to display at its shows in the future must fight tooth and nail to have the CAA revise how its rules are applied to this venue. It should have been obvious that Old Warden was not a normal airfield nor airshow venue and for it to fall under the blanket application of new regulations is totally illogical. The Shuttleworth Collection represents a phenomenal wealth of British aviation heritage, something the CAA should be keen beyond measure to promote and preserve. Old Warden may permanently remain a special place, but the industry should fight especially hard to preserve the beauty of flight that can only be found at this airfield. The aircraft have been flown there safely for decades, and did not become any less safe since last season - not with regards to the crowd, that is. With aircraft such as these, pilot safety should be as paramount as ever. With some of the most experienced pilots in the country in their respective fields decrying the new regulations as unsafe, it is obvious, and even imperative, that the CAA must review them at some point; the analysis and opinion of these people, who are the lifeblood of the airshow scene and whose knowledge is second to none, absolutely cannot be ignored - to do so would be (and the argument could be made already has been) highly irresponsible. 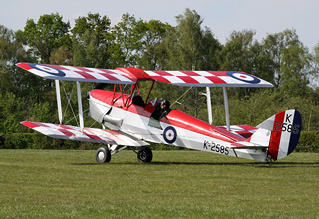 Old Warden is a benchmark for the whole civilian airshow circuit. It has a charm, an atmosphere that puts it right at the top of the list and it's a target for other shows to aim for. We frequently hear on our forums and elsewhere that a small civilian show somewhere in the country "was like a Shuttleworth show" - an extremely high compliment. Popular opinion following Sunday's show has been that the flying display has been reduced to a skeleton of its former self, and that the show (in the air, at least) now has nothing to top that found at any other venue. Old Warden will remain a special place, there's no doubt about that, but if the new rules imposed from above can take away any amount of its magic, anything of the special qualities that make it unique in this country, then the effects of such will be orders of magnitude greater at any other venue you could name in the UK. This was always going be a rocky season for the UK airshow enthusiast, but in the light of what has been lost even at this most outstanding of locations we must, as a community and in coordination with the industry, work hard to prevent the magic from disappearing completely.